Every organization has a core set of mission-critical data that must be protected. Security lapses and failures are not simply disruptions—they can be catastrophic events, and the consequences can be felt across the entire organization. As a result, security administrators face serious challenges in protecting the company’s sensitive data. IT staff are challenged to provide detailed audit and controls documentation at a time when they are already facing increasing demands on their time, due to events such as mergers, reorganizations, and other changes. Many organizations do not have enough experienced mainframe security administrators to meet these objectives, and expanding employee skillsets with low-level mainframe security technologies can be time-consuming. The IBM® Security zSecure suite consists of multiple components designed to help you administer your mainframe security server, monitor for threats, audit usage and configurations, and enforce policy compliance. Administration, provisioning, and management components can significantly reduce administration, contributing to improved productivity, faster response time, and reduced training time needed for new administrators. 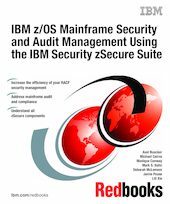 This IBM Redbooks® publication is a valuable resource for security officers, administrators, and architects who wish to better understand their mainframe security solutions.